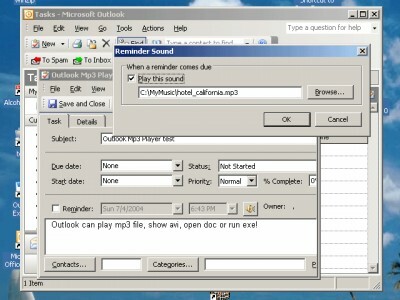 Outlook Mp3 Player 1.0 free download. The Reminder of Microsoft Outlook can play only wav-file alarms. The Reminder of Microsoft Outlook can play only wav-file alarms. This Outlook Add-In component allow to play as alarms any music and video files ( mp3, mpg, avi, etc. ), open any document ( doc, rtf, txt, etc. ) or run any executable program (com, exe, bat, etc.). Choose any file of any type using the standard Outlook Tasks Parameters Form and it will be played, opened or run according due. ArtTray is an application created to be just a nice system tray dropper and minimizer. My Alarm is a free , useful, quick and simple way to run programs or play music at a set time, day or date. Are you unsatisfied with Office Outlook 2000/XP that simply "'ping" a sound and show a small icon in TrayBar when a new unread mail appear in your Outlook Inbox ? Tired to get big popup windows for your Reminders and Alarms that make you loose application focus and force you to click away ? Outlook Notification Gateway (ONG) is a usefull tool that will intercept and redirect all "unread" and "reminder" events from Outlook Office into a much nicer display interface that do not disturb you, do no need any click and let you directly see important informations. Anti-Dupe for Microsoft Outlook is a free and simple software add-in utility that allows you to delete unwanted duplicate records in your Microsoft Outlook folders. Outlook Reminder will display Outlook calendar items of today and/or tomorrow, as a Tooltipballoon at windows startup. The perfect software tool for all form developers! DocMessageClass changes the message class of Outlook entries, so that also later provided forms can be assigned. DeskTask will connect to MS Outlook and display your calendar and task items on the desktop. Yahoo! Desktop Search will help you quickly locate almost any file on your computer, including email, spreadsheets, images, Microsoft Outlook contacts, and many more. Advanced Security for Outlook lets you get rid of the annoying security alerts in Microsoft Outlook 2, 2002/XP and 2003! Advanced Security for Outlook allows you to determine the violator and specify the permanent action for this program (and only this!) : allow access, block access or run the default Outlook handler. Public Contact after Reply for Outlook (Public CAR for Outlook) is an small and useful addon for Microsoft Outlook, which create automatically Outlook contacts after reply to a received E-Mail.